As far as $20 headsets go, the Mpow Pro Trucker is among the best out there, allowing your phone calls to sound great while keeping your hands free. In a world where headphones have built-in mics, and the earbuds that come with your phone largely do the work of a separate microphone peripheral, it might be hard to convince yourself that you need a standalone headset. The Mpow Pro Trucker makes a strong argument in favor, due to its solid call quality and affordable price tag. Of course, there are plenty of core features you’d look for in a Bluetooth headset—things like call clarity, decent battery life, and solid connectivity. None of these are top of the line, but if you want something that won’t hurt your wallet and maybe outfit a small office, the Pro Trucker is a great option. The headset is about as standard as you could expect from a looks perspective; it’s the same type of unit that you’ll see in most call centers. The earpiece itself measures in at about 1.75 inches, while the boom mic measures about 5.25 inches, and the headband sits at just under 6 inches from earpiece to the top of the head. Mpow goes for a pretty standard one-earpiece look here, and the minimalism works well. We got a black unit in to test, and it’s peppered with a couple of silver accents (around the circular Bluetooth button and the volume up/down buttons on the earpiece). You can buy an all-black, stealthier version called Pure Black, or a flashier Purple version. In our opinion, the boom mic is a little too long, and the fact that it widens out a bit toward the end draws a bit more attention to it than we’d like. Higher dollar headsets tend to have shorter boom mics and still accomplish decent sound quality. Because you aren’t spending premium dollars on this, the construction does feel a little cheap at first shake. It’s built of mostly soft-touch plastic with a thin metal headband, much like old school headphones. Many headsets that employ this construction are somewhat doomed to bending and loosening. We were pleasantly surprised that this doesn't seem to be the case with these. The metal band is very strong, and the notched mechanism that allows you to adjust the size of the headband—the point at which many similar headset constructions fail—is very firm. The earpiece is also really substantial, and while that fact contributes to the lack of comfort, it seems like it won’t break down very easily. The pivoting boom mic also seems pretty firm and not super-prone to wearing out over many swivels. There aren’t any official claims about water or dust resistance, which is mostly to be expected as units like this seem catered to office use. If you plan to use these on the road or on the go, it’s probably best to keep them out of the elements, and avoid using them during workouts. There are two main factors to consider when looking at comfort for a headset: the weight and the feel of the materials. The weight on this headset is pleasantly light, so much so that when we received the box, we weren’t even sure the headset was inside of it. The manufacturers put the weight at 1.48 oz, which was confirmed by our scales. That’s great because it won’t weigh down your head during longer phone calls. The other factor, the feel of the materials, is a bit more complicated in this case. The earpiece is rugged and solid on first view, but because there’s such a thin layer of padding, it has very little give, making it a point of discomfort for your ear. We found that it pressed too hard against the curves of our ear, and was generally too small to sit properly. On the other side of the headset, there’s a stabilizing, crescent-shaped pad that actually provides a bit more comfort than we were expecting. It isn’t a hard plastic, but rather a zig-zagged rubbery foam that sits loosely in a pivoting socket. It actually felt like this part was a little rickety, but after putting it on, we could see that this was by design because it provides a nice, soft amount of give rather than having a hard plastic piece pressed against your head. One of the best qualities of this headset happens to be the key feature of a Bluetooth headset: beautiful call quality. To be clear, we didn’t find the headphone part to be particularly well-rounded, so don’t plan to get in any high-definition listening. But when we fired it up for business calls, it really was impressive for the budget price point. The mic itself is omnidirectional with some built-in noise canceling. It does the job really well, especially for an omnidirectional mic. Plantronics accomplishes the noise canceling with a 4-mic array built-in, so it’s no surprise that it does such a good job. Again, the earpiece doesn’t contain a world-class speaker driver, but we found that they optimized it for calling, with a good focus on the part of the frequency spectrum where the human voice lives. Add that to a swiveling microphone that will pivot 330 degrees you can angle it to perfectly up your voice, plus you can also articulate it to wear the earpiece on the other ear. When we fired it up for business calls, it really was impressive for the budget price point. We spent a few working days with our unit, and the battery life was something we almost never had to think about. The manufacturer advertises that you’ll get 12 hours of talk time and 200 hours of standby time. This is actually pretty impressive for the category, and in our tests, we got around 11 hours of use, so you can rely on these numbers. On a certain level, standby time is the more important figure, because you’ll spend most of your time with this headset waiting for a call. If it won’t stay charged up while you’re waiting for the next call, then it won’t be reliable enough to work as your main headset for a standard 8-hour workday. It charges up with an included micro-USB cable, which is another refreshing factor, because many of these headsets require a proprietary dock system. So while you don’t have a fancy stand to put the headset on, you’ll at least be able to use virtually any of your micro-USB cables lying around to give the battery a charge, and it will take between 2.5 and 3 hours to fully charge it. Another key feature for a Bluetooth headset is the stability of its connection. There’s nothing more distracting when you’re on an important phone call then having the wireless connection drop out. The Mpow Pro Trucker uses a Bluetooth 2.1 protocol, which is far from the most modern option, however its Class 2 levels will give you around 30 feet of range, which is fine for if you’re at a desk, but less ideal for moving around. It also connects to your phone with the standard headset protocol, meaning that your phone will default to this Bluetooth protocol when calls come in. You can connect it to two devices, and it will easily hook into either when called up. This worked pretty well in our tests, though it offered no flashy connection prediction technology like more expensive headsets. But it does do the job with very little interference and dropout, even when walking away from the connected device. If you’re looking for a cheap Bluetooth headset, or you want to buy a few to outfit a team at your business, this is a great choice. 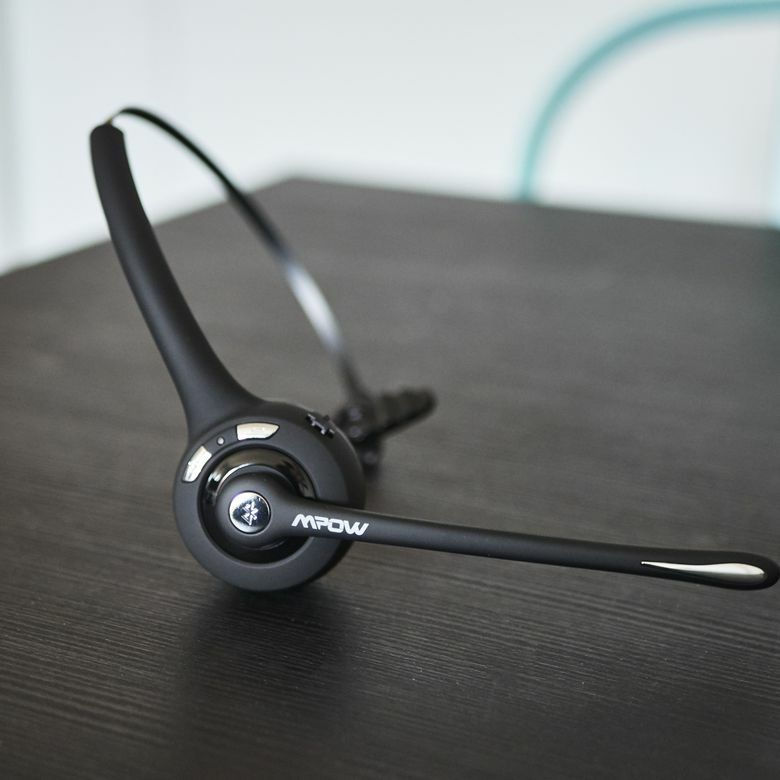 If you’re looking for a cheap Bluetooth headset, or you want to buy a few to outfit a team at your business, the Mpow Pro Trucker is a great choice. Many of the other options out there will run you well over $50, but Mpow has an amazing price point right around $20. For most other headsets with the same collection of features you’ll likely be paying $40 or more, so it’s impressive Mpow has managed to give you such a solid headset for the price. Plantronics Voyager Legend: If you’re looking for a smaller footprint, and have a few more bucks, the Voyager Legend is a really reliable option that is meant more as an “always on” headset. Mpow Pro Trucker vs. Plantronics Voyager Focus: The Plantronics Voyager Focus is significantly more expensive, so it really isn’t a clean comparison, but this is one of the best options out there when it comes to quality. If you want the best Bluetooth headset available, this is definitely one to consider. Check out our other reviews of the best Bluetooth headsets available on the market today. A reliable buy and a great value. The Mpow Pro Trucker really is an impressive unit: solid connection, amazing voice call clarity, a super-light build, and perfectly reliable battery life for around $20. That said, you aren’t going to get the premium build of the Plantronics headsets, and you might find it a bit uncomfortable if you’re planning to wear it all day. Product Dimensions 6.6 x 6.6 x 2.2 in.